Tom and Sheri Gay pose at a Wareham Gatemen game during the 2016 CCBL season. 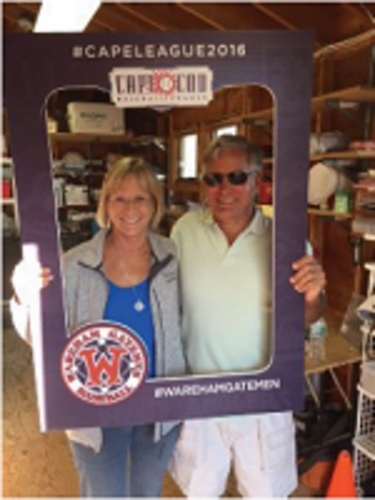 Tom and Sheri Gay started out as a host family for the Wareham Gatemen of the Cape Cod Baseball League in June, 1997. They were honored on January 29, 2017, with the Fred Ebbett Award of Distinction by the Massachusetts Baseball Coaches Association. Each year, the MBCA presents the special award to men and women who serve the youth of Massachusetts by making significant contributions to amateur and youth baseball in their communities. Sheri got more active with the Gatemen each year, eventually becoming the Chair of Housing (15 years), Secretary (17 years) and VP of jobs and team outings (17 years). She has served on the important budget committee and in 2000 she was named the liaison to the Wareham School Department. In 2015 Sheri was invited to serve on the prestigious Cape League Hall of Fame Committee. In the meantime Tom was busy with local youth baseball in every way possible. He was president of Gateway Babe Ruth (1997-2006). He also coached a team and went to the regionals twice and the state tournament twice. In addition, he was Commissioner of the South Coast Baseball Alliance. He also managed an AAU team called the Sippican Bulldogs and went to Cooperstown Field of Dreams, St Louis and Disney Wide World of Sports (1998-2006). Tom was also the founder of the Friends of Marion Youth, Inc, a non profit organization which raised money to support youth athletic programs in Marion, Mattapoisett and Rochester. For close to a decade, Sheri and Tom had their "own games" during the summer and were like ships passing in the night. Then one year Sheri asked Tom to consider getting more involved with the Wareham Gatemen. So, in 2005, Tom became VP of Public Relations and then Assistant GM the next year. He went on become GM and President of the Gatemen in 2009 and held both position for 6 years. In 2015 he settled into the role of "just" President, while Andrew Lang (New Bedford's former Major Scott Lang's son) became the GM. In 2006 Tom also became very involved in the Cape League, on the "league level", serving on the Executive Committee for 11 years. In addition, he has served on several subcommittees like by-laws, All Star Game, and nominating committees. The Gays are a couple who, together, have devoted many years to baseball in Mass. This has been on the youth and college level. They have worked tirelessly on a year-round basis, dedicated to youth baseball, Gatemen baseball and the Cape Cod League. They have been honored by the Lowell Spinners for community service in baseball. In 2008 Tom also received the Massachusetts Bar Association Community Service Award. And in 2012 he was named Executive of the Year" by the Cape League.